Our transformers are manufactured in accordance with national and internationally recognised standards. They are fully compliant with the Tier 1 EU commission regulation 548/2014 on Ecodesign. 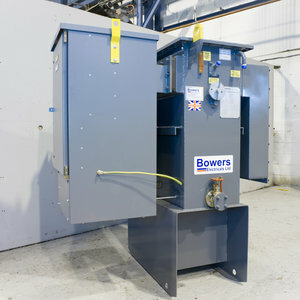 Affordable and with all the guarantees that the Bowers name brings, the range is manufactured to BSEN60076 standards. We carry many both for stock – ensuring a fast turnaround from the time of order – and to meet customers specific requirements. Every unit designed with HV and LV flanges to BS2562 facings suitable for accommodation of bolt-on HV and LV cable boxes or LV transformer mounted feeder pillars/ACB/MCCB cabinets and HV transformer mounted switchgear to ENATS standards. Bowers standard units are also fitted with bolt-on panel design radiators and have been carefully designed so that HV switchgear can be fitted without interfering with the radiators – removing the need for extensive throats. If you are unsure how the Ecodesign legislation affects you, have a look at our FAQ or get in touch.